If you thought that your SOCOM 4 purchase would be devoid of aliens, think again. Initial shipments of SOCOM 4 will come packaged with a voucher for entry into the Resistance 3 multiplayer beta. 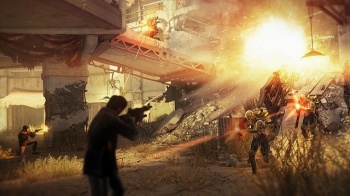 While the announcement on the beta doesn't reveal a starting date, the post on the PlayStation Blog reads, "to find out when the Resistance 3 beta begins, be sure to check the details on the included voucher." The beta voucher is included in both the standard edition of Socom 4 and the insane Full Deployment Edition. Insomniac Games has already thrown out a few details on the changes that Resistance 3 is undergoing in terms of multiplayer such as smaller-scale 16-player battles as opposed to the 60-player Skirmish matches featured in Resistance 2. 60 players certainly felt like an overwhelming number of people, so hopefully the changes will make for tighter multiplayer matches. SOCOM 4 is set to arrive in just a few short weeks on April 19, while Resistance 3 is currently set for arrival on September 6.